Just how does one even begin to understand how the President would place people into positions that seem like placing the proverbial Fox in the Chicken Coop? 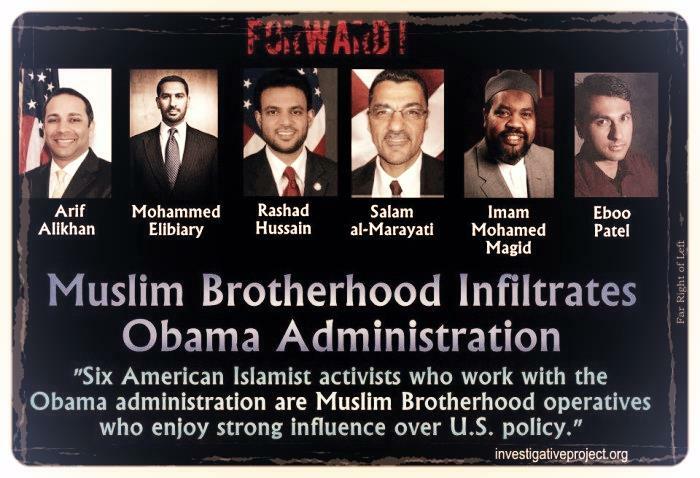 Barack Obama has placed individuals who represent, or are a part of, the Muslim Brotherhood into high security positions. Is this due to the fact that Obama is a Muslim? Is this due to the fact that Obama may think that showing the Muslim community he has placed Muslims in high positions will stop them from hating the United States? Could this be due to his Marxist ideology he developed while at Occidental College? Maybe, just maybe, it is because Obama just does not wish for the United States to be strong and he wants to show the world the United States is not the leader it once was. One thing Obama has shown to the world is that he is not a world leader nor is he an American leader. Let us get to the people we are talking about and the positions they have been placed in by Obama. We’ll also see what their background is, and how it could ruin the United States. First, we must mention a recent report about a new “Party” being comprised of the same type of individuals that killed all those people in the Twin Towers! This new party is made up of fundamentalist Muslims here in the United States with their main goal being to take over the United States from within. Their plans are to place their candidates into elections to win so they can destroy the Constitution and create a nation of Islamic laws! These very people we are about to expose are associated with this line of thinking, and the Socialists/Marxists within Congress are showing them the way. The majority of what is contained in this article is backed up by links to sources that that you can read and decide for yourselves whether or not there is a serious Islamic threat to the United States. An opponent of President George W. Bush’s prosecution of the war on Islamic terror, Alikhan was responsible for derailing the LAPD‘s efforts to monitor activities within the city’s Muslim community, where numerous radical mosques and madrassas were known to exist, and where some of the 9/11 hijackers had received support from local residents. In April 2009, President Barack Obama‘s Department of Homeland Security (DHS) Secretary Janet Napolitano appointed Alikhan as assistant secretary for DHS’s Office of Policy Development. Hussam Ayloush, executive director of the Council on American-Islamic Relations‘ Los Angeles branch, praised the “well-deserved” appointment. Thirteen days prior to his DHS appointment, Alikhan, a devout Sunni Muslim, had participated in a Muslim Public Affairs Council fundraiser titled “Be the Change,” to support that organization’s leadership-development programs. Arif comes from Los Angeles Mayor Antonio R. Villaraigosa’s office, where he served as Deputy Mayor for Homeland Security and Public Safety. As a key adviser to the Mayor, he has led the City’s efforts to develop homeland security, emergency management and law enforcement initiatives, including operational oversight of Los Angeles Police, Fire and Emergency Management departments. He is a former federal prosecutor and senior advisor to the U.S. Attorney General, and has partnered extensively with local, state and federal agencies. Before serving as Deputy Mayor, Alikhan was a career prosecutor with the U.S. Department of Justice from 1997-2006. During that time, he served as Chief of the Cyber and Intellectual Crimes Section for the U.S. Attorney’s Office in Los Angeles and as a Senior Advisor to the U.S. Attorney General in Washington, D.C., where he oversaw the national Computer Hacking and Intellectual Property Program for the Department of Justice. Alikhan holds a J.D. from Loyola Law School and a B.A. from the University of California, Irvine. Devout Muslims being appointed to critical Homeland Security positions? Was it not men of the “Devout Muslim Faith” that flew planes into U.S. buildings not too long ago? What the heck is this president thinking? Here we show devout Muslim style people holding posts that have deep inside operations over the “Security” of the United States! Now, one has to wonder why has this happened and what was Obama thinking of when he made these appointments? Is this just a reflection of Obama’s deep inside ideologies, or is this Obama’s way to work out his Marxist ideology he was developed back in 1981? We must move on to the other 5 individuals with backgrounds deeply embedded with Muslim ideology, and in some cases, links to the very Muslim Brotherhood that is proud to state they wish to destroy the United States. This is the same Muslim Brotherhood that Barack Obama’s brother, Malik, helps to finance and of which the Egyptian media has said Obama is a member. As a side note, one of Barack Obama’s foundations, which was founded by Malik, is tied to terrorism. Now, here we have an individual that is an Islamic Cleric! Mohamed Elibiary is a Texas-based Islamic cleric who founded Lone Star Intelligence LLC, a security crisis consulting firm, and the Freedom and Justice Foundation (F&J), a Muslim nonprofit group established in November 2002 to “promote a centrist public-policy environment in Texas by coordinating the state-level government and interfaith community relations for the organized Texas Muslim community.” F&J played a key role in successfully lobbying for the passage of Texas’s Halal Food Law (the state’s first Muslim consumer-protection statute), and for the institution of Islamic prayers (recited by Imams) in both chambers of the State Legislature. In October 2011 it was reported that Elibiary had recently been given access to a highly sensitive DPS database (the Homeland Security State and Local Intelligence Community of Interest, or HS SLIC) containing hundreds of thousands of intelligence reports intended solely to aid law-enforcement agencies. In fact, Elibiary was the only Homeland Security Advisory Council member (out of 26) who was permitted to view the HS SLIC. In early November 2011, Elibiary’s access to the HS SLIC database was revoked. He retained his post as a Department of Homeland Security advisor, however. In September 2013 he was promoted to senior advisor at the Advisory Council, a title held only by a small number of select members. In October 2013, Elibiary said: “I do consider the United States of America an Islamic country with an Islamically compliant constitution.” What he meant was that the Constitution and Islamic law reflect the same values and principles. On more than one occasion in 2013, Elibiary opined that his close friend, former Holy Land Foundation president and CEO Shukri Abu Baker — who had been convicted in 2008 of financing the terrorist organization Hamas – was, in fact, an innocent victim of political persecution. Is it any wonder that Obama is seen as a very weak President? Making appointments like this do not help with a firm appraisal of the situation. Elibiary has serious problems engaging in taqiyyah, as evidenced here, here, here and here. In October 2000, Hussain spoke at a conference sponsored by the Association of Muslim Social Scientists and Georgetown University’s Prince Alwaleed Center for Muslim-Christian Understanding. Titled “Islam, Pluralism, and Democracy,” this gathering featured appearances by numerous leaders of the global Muslim Brotherhood, including such notables as Louay Safi, Jamal Barzinji, Hisham Al-Talib, and Abdul Hamid Abu Sulayman. In June 2002, Hussain participated in a Congressional Staffers panel at the American Muslim Council‘s (AMC) 11th annual convention. At that time, AMC was headed by the Muslim Brotherhood leader Abdurahman Alamoudi, who would later be convicted and incarcerated on terrorism charges. In 2003, Hussain was a recipient of the Paul & Daisy Soros Fellowship for New Americans, which was founded by, and named after, George Soros‘s older brother and sister-in-law. In January 2009, Hussain — recruited by Cassandra Butts, advisor to (and former Harvard Law School classmate of) President Barack Obama — was named deputy associate counsel to the President. In that position, Hussain focused on issues involving national security, new media, and outreach to the Muslim community. As Obama prepared for his June 2009 trip to Cairo, Hussain helped Ben Rhodes, the President’s principal foreign-policy speechwriter, draft the address that Obama would deliver at Cairo’s Al-Azhar University. According to Hussain, his own input was geared toward emphasizing the contributions that Muslims have made to American society, and clarifying the context behind some passages in the Koran. In August 2010, Hussain took part in an interfaith “bridge-building” trip organized by the Muslim Brotherhood-affiliated Suhail Khan. Steven Emerson of the Investigative Project on Terrorism pointed out that “two of the Islamic leaders attending the trip … had made anti-Semitic, radical Islamic statements or [had] justified terrorist attacks” on previous occasions. Now could one even think of the kind of flack a Republican would garner to have this guy associated with the White House in any way? It has to make one wonder just what is Obama doing? Is he really making a very bold attempt to destroy the United States? Let us continue. Just these 3 things alone should have brought forth questions, but we as Citizens of the United States have been asleep at the wheel and now need to take that wheel away from Obama and all his Islamic, Socialist, Communist, and Marxist friends before we lose our very freedoms. Take a look at this guy’s background. Salam Al-Marayati is the founder of the Muslim Public Affairs Council (MPAC), a Los Angeles-based Islamic advocacy group that defends Muslim extremist violence. MPAC has condemned the anti-terrorism measures of both the U.S. and Israel and has called for a repeal of the Patriot Act. On the afternoon of September 11, 2001, Al-Marayati used a Los Angeles talk radio program as a forum in which to accuse the Israelis of responsibility for that morning’s attacks on New York and Washington. Al-Marayati has also called for the U.S. government to unfreeze the assets of two Islamic charities, the Global Relief Foundation and the Holy Land Foundation, that were shut down by the government because of funding they had given to terrorist organizations. In October 2010, the Barack Obama administration picked Al-Marayati to represent the U.S. government at the annual Organization for Security and Cooperation in Europe human-rights conference, known as the Human Dimension Implementation Meeting. Now this guy seems to be a real piece of work. He should never be associated with any part of the United States, especially when it comes to advising the president and having any say in domestic or foreign policy. This shows a direct link to Obama himself and this guy is a “leader” of a group that does not like the United States Constitution nor its people! But let us show you just who this character is! In 2011 President Barack Obama appointed Magid to serve on the Department of Homeland Security’s (DHS) Countering Violent Extremism Working Group. In this position, Magid was authorized to train and advise personnel affiliated with the FBI and other federal agencies. He soon became a regular visitor to the White House, and merged as perhaps the most influential and sought-after Muslim authority in the United States. In his new DHS role, Magid, claiming that media references to jihad as “holy war” constituted a “misuse” of the term, asked Assistant Attorney General Thomas Perez to: arrange for Magid to meet regularly with top Justice Department officials; allow Magid to reeducate FBI agents vis a vis Islam and its practitioners; and carefully avoid criticism of Islam, which Magid characterized as “religious bigotry and hate.” Magid and other Muslim lobbyists also persuaded government officials to ban the practice, at airports, of conducting the extra security checks on passengers traveling from a number of Islamic countries — checks that had been instituted after a Nigerian Muslim tried to blow up a passenger plane on Christmas Day 2009. In response to pressure from Magid and his fellow lobbyists, DHS carefully erased from its “Countering Violent Extremism” curriculum any suggestion that Muslim terrorism drew its inspiration from the laws and doctrines of Islam. In 2012, the FBI purged some 700 documents and 300 presentations from its training materials and lesson plans. On March 8, 2013, Magid and ten religious leaders met with President Obama for a 90-minute conversation about immigration reform. Also present at the meeting was senior White House adviser Valerie Jarrett. Three days later, Magid took part in a meeting with Obama where the President listened to “recommendations” designed to help him prepare for his upcoming diplomacy trip to the Middle East. In addition to his DHS work, Magid has also served with the National Security Council and has been a member of the FBI’s Muslim, Sikh, and Arab Advisory Board. * Magid is a member of the Peaceful Families Project; the Annual Twinning of Mosques and Synagogues; Fairfax Faith Communities in Action; the Interfaith Conference of Metropolitan Washington Assembly; the National Interfaith Planning Committee for Domestic Violence; the Buxton Interfaith Initiative; and the George Mason University Campus Ministry. He is also the chairman of Fairfax County Faith Communities in Action, a board member of the Fairfax County Partnership for Youth, and a board member of the FaithTrust Institute. * In 2010 and 2011, Magid attended Ramadan Iftar Dinners at the Obama White House. Is it just us or does it seem that these people shown here do not present the best ideas for a free United States? How in the world could anyone place such individuals in the positions Obama has them in? This makes the United States look weak, giving refuge and high security clearance to people that do not wish the nation any good! However, there is one more individual we wish to expose. Now this is going to get very interesting, but why has the “Lame Stream Media” overlooked this one? In 2005 Patel and several young radicals co-authored the book Letters from Young Activists: Today’s Rebels Speak Out. Among Patel’s co-authors were Chesa Boudin (the adopted son of former Weather Underground terrorist Bill Ayers) and Ismail Khalidi (the son of Columbia University professor Rashid Khalidi). The book’s Preface was written by Ayers’ wife, Weather Underground co-founder Bernardine Dohrn. The back cover featured an endorsement from the convicted cop-killer and former Black Panther Party member Mumia Abu-Jamal. And on the Acknowledgments page, Patel and his fellow authors thanked Ayers personally for the “guidance” and “encouragement” he had provided. In late July 2011, Patel spoke at the main event of a three-day convention held by the Muslim Students Association. Specifically, he participated in a panel alongside Tariq Ramadan (grandson of Muslim Brotherhood founder Hasan al-Banna) and Siraj Wahhaj (who was named as a possible co-conspirator in the 1993 World Trade Center bombing). Patel is a regular contributor to the Washington Post, National Public Radio, and CNN. 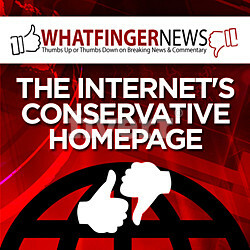 He has blogged for the Huffington Post, USA Today, and Sojourners, among other outlets. Moreover, he has served on the Council on Foreign Relations’ religious advisory committee, the Aga Khan Foundation’s national committee, and the Duke University Islamic Studies Center’s advisory board. He is a fellow of the Ashoka Foundation, and has spoken in such major venues as the Clinton Global Initiative and the Nobel Peace Prize Forum. Now this guy sounds bad. Could you think of what he would have done had he lived and worked with Bill Ayers in the Weather Underground? To have this man as the head of your “Advisory Council on Faith-Based Neighborhood Partnerships” just seems to be extending a hand to the devil himself! We have shown just a few of the very questionable appointees that Obama has made, and these people should have raised red flags all over the place. The so-called “News Media” should have been on this like flies on sugar, but it appears that the people just do not seem to care or they are apathetic. They just do not want to see what is going on in their own backyard, and even though it is a big one, the entire United States is our back yard. If we don’t know what is going on in our own back yard, one day we will wake up to Bayonets in our faces, being marched off to camps of reorientation, or worse! If we as a nation do not wake up, and soon, it may well be too late to save the US from the throws of Dictatorship and the caliphate. We know this sounds very critical, but if we do not take a stand as was done in Nevada with Cliven Bundy, we will all lose our freedom. Are You An Eloi Or a Morlock?